We spent some time day hiking in the Clear Creek state forest Kennerdell Tract recently. 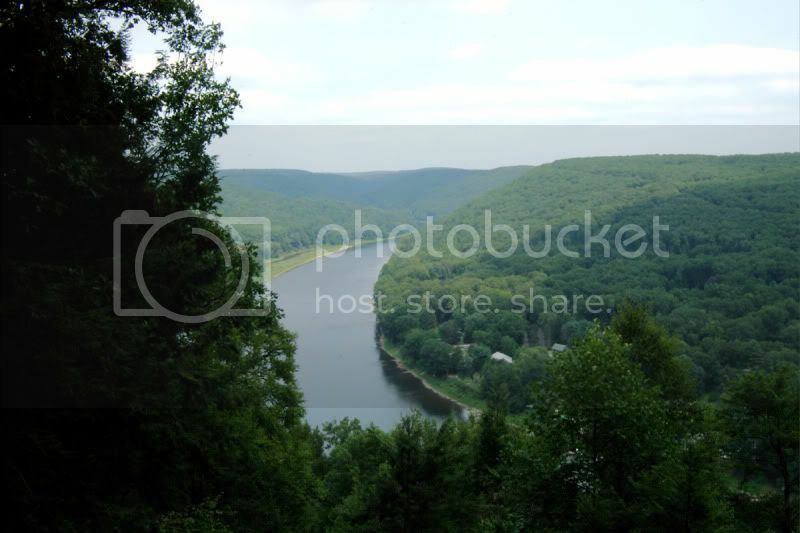 The forest rests on the Allegheny River just north of I80 making access very convenient. Dispersed camping is permitted in the forest and many of the trails are multi-purpose. The “hike only” trails are not marked as such so we saw many bike tracks and dodged some horse poo on most of the trails. We chose to park at the Kennerdell Bridge to begin our trek: There is room for about six cars here without blocking the gate. The trail from here leads north along the river and is a lightly graveled service road. Signs are posted along the way identifying different trees of the forest and numbered posts for a self-guided tour show up occasionally too. There are a number of houses on the opposite riverbank and occasionally you will hear a boat motor but mostly it is quite peaceful. At about 0.8 miles the trail crosses Dennison Run. There is an established campsite here with enough room for several tents and it is just off the river so it would make a decent spot to stop if you were yakpacking. We chose to take the Dennison Run trail up to the overlook: There are several good spots for camping along this trail too. Overlook trail turns south and climbs up nearly 500 vertical feet in less than half a mile. It is a fairly well established trail, signed and freshly blazed, though we did miss a turn at one point. (After lunch I went back to see how that had happened, it seems the trail was moved at one point and we missed the small blazed tree hiding behind a larger tree.) The overlook itself is a great view of the Allegheny River valley and has a bench as well as some local history plaques. Our next stop was the Bullion Run Iron Furnace. Gently rolling terrain and wide, well established trails lead us to the dear exclusion fence. This area shows the vegetative difference of the forest where no deer exist and is quite remarkable. Entering through a self-closing door, the trail narrows with an explosion of the forest shrub layer: simply put, deer eat a lot. There is no water along these trails except at the base of the mountain. Iron furnace trail runs along a tributary of Bullion Run but what little water was there was barely filterable: we waited until we got to the bottom. The iron furnace here consumed an acre a day of forest while in operation, and they stockpiled their product until water levels were high enough to transport to Pittsburgh: it is a neat side trip. Back up the mountain, we headed east on South Trail and finally down the mountain on Kennerdell trail passing some very large rocks and small caves. Beyond that, the climb down to the road is very steep and very narrow; it was actually a bit worrisome. Back at the car, the GPS stated 5.5 miles in as many hours: but keep in mind our group contains three under the age of twelve. Lunch and breaks are frequent and long not to mention every rock outcropping becomes a side trip. We will likely backpack the northern section of the forest this fall, and with the trails being wide and well established, we will spend some time there this winter on snowshoes. Great report . I can almost visualize being there .